What would Thanksgiving be without the stuffing? Thankgving is the one time of year that you can indulge in a carb-apalooza with no guilt the next day, and stuffing is the carbohydrate gold standard. 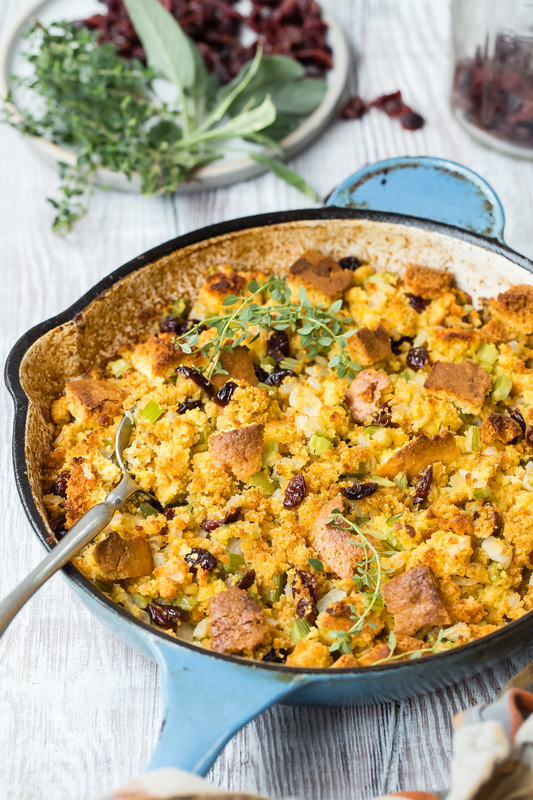 For most kids (mine included) who would subsist on bread if given the choice, holiday stuffing is probably their favorite dish of the day! At least that’s how I felt when I was little. My Grandmother always made cornbread stuffing and oyster dressing for our family’s holiday celebration. I vividly remember how we kids would all line up in the kitchen, placing heaps of the stuffing on our plates while the adults dug into my Grandfather’s favorite, the oyster dressing (another name for stuffing). To this day, the thought of oyster dressing makes me want to gag, which is why in comparison I'm sure I put the cornbread stuffing of my youth on such a culinary pedestal. I've updated my Grandmother’s basic recipe here by tossing in some cranberries for added color, taste and texture -- and also because my kids just plain love ‘em. Don't drive yourself crazy if you don't have time to make homemade cornbread, any decent boxed variety or store-bought kind will do. 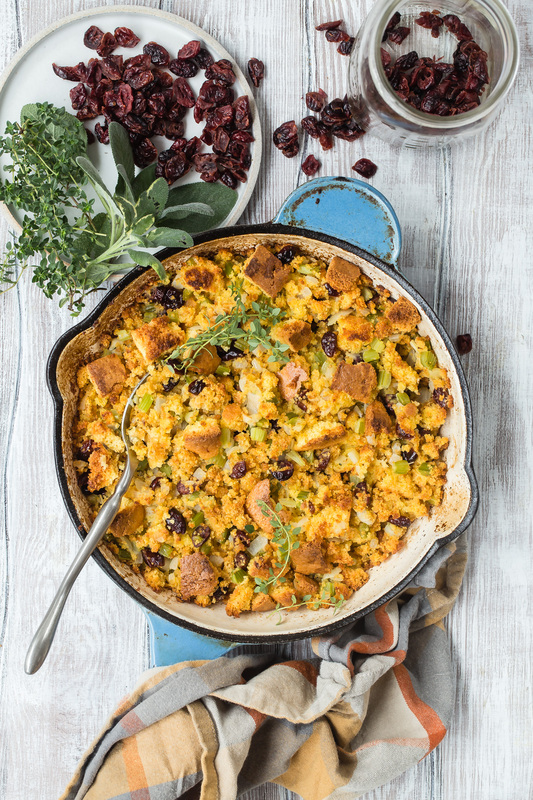 For this recipe, it’s all about the stuffing! 2. Break apart cornbread into chunks and place onto a baking sheet. Toast in the oven for 10 minutes until dried out. 3. In a sauté pan heat the butter and then sauté the onions, celery, salt and thyme for 8 minutes until tender. 4. Whisk the chicken broth and egg in a bowl until combined. 5. Place the toasted cornbread pieces, the onion celery mixture and egg mixture in a large bowl with the cranberries and toss to combine. 6. Place stuffing in a buttered 7 x 11 baking dish and bake for 45 minutes. 2. Combine the first 5 ingredients in a bowl. 3. Whisk the milk, oil, and egg in another bowl. 4. Add the wet ingredients to the dry ingredients and stir until blended. 5. Pour batter into a greased 8 x 8 baking dish and bake for 20-25 minutes. How would you make the cornbread dairy free? and can I substitute margerine or veg. oil for the butter in the recipe as well? This looks great. Two of my favorite Thanksgiving dishes: cornbread and stuffing combined. I added chicken/apple sausage this recipe and it was incredible! You could definitely see your skills within the paintings you write. The sector hopes for even more passionate writers such as you who aren't afraid to say how they believe. At all times go after your heart. could i substitute boxed cornbread mix instead of making my own? Is something missing from the cornbread ingredients list? Directions say to combine the first 5 ingredients, but there are only 4 dry ingredients listed. I did not see any sweetener in the recipe, so maybe sugar is missing??? Thank you! I've updated the recipe. It is 2 tablespoons sugar! After step 3 should I leave the toasted cornbread on the counter and vegetable mix in the fridge to finish the rest for tomorrow? Thanks!